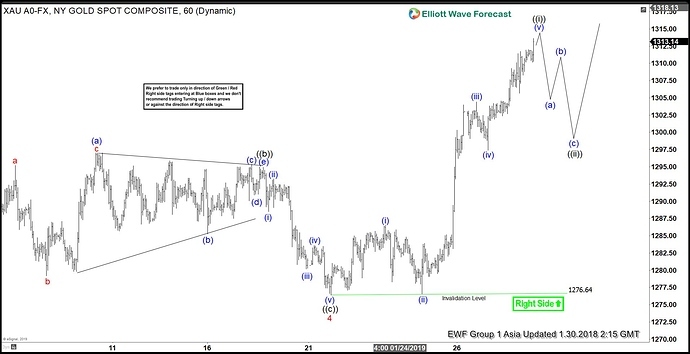 Elliott Wave view in Gold suggests the pullback to $1276.64 ended wave 4. Internal of wave 4 unfolded as a zigzag Elliott Wave structure. Wave ((a)) of 4 ended at $1276, wave ((b)) of 4 ended at $1295, and wave (©) of 4 ended at $1276.64. Rally from there looks impulsive and expected to end wave ((i)) soon as a 5 waves impulse Elliott Wave structure. Up from $1276.64, wave (i) ended at $1286.53, wave (ii) ended at $1276.59, wave (iii) ended at 1304.41, and wave (iv) ended at $1297.40. Expect the yellow metal to end wave (v) soon and thus end wave ((i)) of larger degree. Afterwards, it should pullback in wave ((ii)) to correct the rally from January 21 low ($1276.64) before the rally resumes. The pullback should unfold in the sequence of 3, 7, or 11 swing. As far as pivot at $1276.64 low stays intact in the pullback, expect Gold to extend higher. As an alternate, the 5 waves move higher can end wave 5 of (3) instead of wave ((i)) of 5. In this alternate scenario, Gold should pullback in wave (4) to correct cycle from September 28, 2018 low ($1180.86) before the rally resumes… Either way, expect pullback in the yellow metal to continue finding support for more upside.